The explosive combination of Pandora and Yuri will make sparks fly high. Two of Latin pop's most sparkling gems will create a truly precious and priceless moment for fans who have long been waiting for this amazing collaboration. The tour dubbed as JUANITAS is reputed to be a show-stopper all over Latin America. And now with its US run, fans will stop at nothing just to get their hands on tickets to the show. Lock-in this date and venue: Saturday, 9th March 2019, at The Forum. With just a few clicks, you'll be well on your way to grace this event. Don't waste another minute. Get on the go and book your tickets now! Pandora and Yuri. One is touted as the Latin America's version of Madonna; while the latter is a celebrated pop-vocal group singing in alluring harmony. A solo act and a vocal trio is a highly combustible formula that will detonate and cause a big explosion onstage at The Forum on Saturday, 9th March 2019. 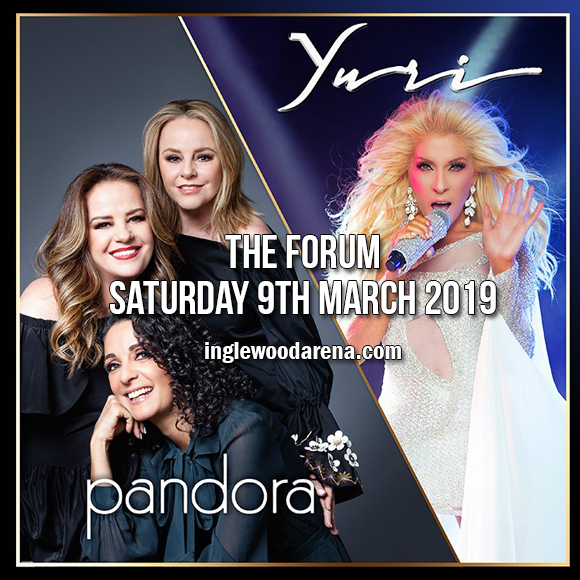 Pandora and Yuri have been performing since the 1980s, and are still at the top of their game in bringing unstoppable energy onstage. Dubbed as the JUANITAS tour, their sold-out Latin American shows have caused big waves that splashing over to this side of the continent. "To me it has been a wonderful experience. It has refreshed me, it has filled me with enthusiasm, it has moved me a lot. It has demanded a lot of this new show, because of the strong commitment not to fail, to do things to a 100%, Pandora exclaims. "Yuri is a wonderful companion, professional, perfectionist, and very demanding. That's great! No one can be distracted. I love it. Great results. We go out with all the excitement of the world to sing. It's something different and we love it." In response, Yuri adds: "We're putting in 'everything.' It has made a super-harmonic work team and with all the disposition." This red-hot ticket is driving fans in a state of frenzy. Book your tickets before the sold-out sign pop-outs. Don't miss this sizzling show, be there when it happens!